love, blind contour: crazy stew! i ate it with my favorite fork, which i abducted from united when airplanes still used real utensils. the pictures in the background were thrift store finds. if you look closely, you can see that the same women is blacked out in both pictures. nothing like good old family drama. they were too good to pass up. 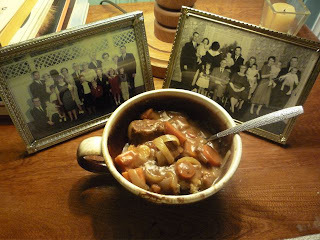 wow, this crazy stew looks delicious--and I love love the photographs. Nice juxtoposition, I mean... warm, hearty stew framed by what seems to be (at first glance) warm family portrait-and then you notice the begrimed faces which makes me think of cold hard aversion... nice. i like. oh, I said that.